Jamala is a founding member of the Organization for Black Struggle and served as Chair of the organization for many years before being selected as the Executive Director. She is an organizer with five decades of experience, a respected leader in the Black Liberation Movement and a prolific writer. Kendra grew up in Ferguson, MO with a passion for her community. Her degree in Black Studies is a testament to her desire to learn about her history and culture to better understand how to make a difference in the world. As an OBS organizer, her focus is on police accountability, court reform and re-envisioning public safety through disinvestment in state repression. Velta comes to OBS with over 20 years of administrative support and office management experience. She brings a positive vibe and professional attitude every day. She keeps the office organized and coordinated. The Organization for Black Struggle (OBS) was founded in 1980. 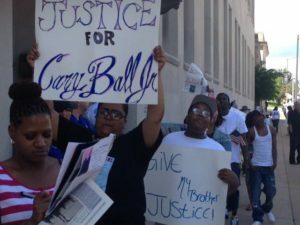 A group of veteran activists, students, union organizers and community members in St. Louis were seeking to address the needs and issues of the Black working-class. There was a vacuum of Black radical leadership that could boldly speak and act, unencumbered by government or corporate structures. In retrospect, this was a challenging period. The FBI’s CounterIntelligence Program, known as COINTELPRO, wreaked havoc on the leaders and organizations of the Black Liberation Movement. By 1980 the right was beginning to consolidate its power politically, with a conservative in the White House for the next 12 years. The country was struggling to get out of the economic recession. It was out of this abyss that OBS was born. OBS studied the organizations of the past to glean from the lessons and best practices on which to build a solid foundation. Local groups like the Congress of Afrikan People (CAP), Action Committee to Improve Opportunities for Negroes (A.C.T.I.O.N. ), and Black Nationalist Party (BNP) had varied life spans and histories that provided valuable information and prevented OBS from reinventing the wheel. Taking account of lessons from previous generations of the Black Liberation Movement has prevented OBS from repeating costly mistakes. The four foundational pillars of our work were the prison industrial complex (including police violence and court corruption, workers rights, women and youth. OBS’ youth wing eventually became a separate tax-exempt organization, the Youth Council for Positive Development. OBS has been called to lead in many other issues facing the African American community such as health care, public education, housing, media and internationalism. Our motto is “Black People on the Move!” because have been at the forefront of the burning issues facing our community. Over the years OBS has been involved in an extraordinary number of local, national and international movements, campaigns and initiatives including (but not limited to): the Anti-Apartheid Movement, African Liberation Day Celebrations, the Black Political Assembly, Justice for Frances Beasley, Atlanta Missing and Murdered Children’s Committee, St. Louis Black United Front, National Campaign Against Racist Genocide, Wrightsville March Against the Klan, Ellen Reasonover Support Committee, the Black Radical Congress, Freeman Bosley for Mayor Campaign, National Black United Front, Show Me $15 Campaign, Coalition Against Police Crime and Repression (CAPCR), the Don’t Shoot Coalition, to name a few. 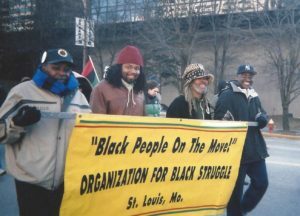 OBS is one of the oldest Black-led, mass organization with radical politics in the state of Missouri. Key to OBS’s longevity is our political analysis, our inter-generational membership and our uncompromising commitment to fight for political power, economic justice and cultural dignity for African Americans, especially the Black working class. OUR THEORY OF CHANGE: To publicize and organize the Black working class to act and in their own self-interests and to build political and economic power in a unified, strategic way. We will fight for the human rights of Black people and all people. We will fight for political democracy. We will fight to advance beyond capitalism, which has demonstrated its structural incapacity to address basic human needs worldwide and, in particular, the needs of Black people. We will fight to end the super-exploitation of all workers. We will struggle to ensure that all people in society receive free, quality public education. We will struggle against state terrorism. We will struggle for a clean and healthy environment. We will fight to abolish police brutality, unwarranted incarceration and the death penalty. We will fight for gender equality, for women’s liberation, and for women’s rights to be recognized as human rights in all areas of personal, social, economic and political life. We will fight to ensure that lesbian, gay, bisexual and transgender people are recognized and respected as full and equal members of society, and of our communities. We will fight for reparations. We will struggle to build multiracial solidarity and alliances among all people of color. We will uphold the right of the African American people to self-determination. We support the liberation struggles of all oppressed people.